Look, you're living in a world where magic exists. I'm sure the bad guys will find a way to unearth the agency. Cooper: I didn't know this place existed. A step up (or down) from a Covert Group is a government agency whose very existence is officially regarded as an Urban Legend and denied by The Government officials. This allows them to maintain Plausible Deniability, in case the agency's activities (which are often of the black ops variety) become known to general public. If, by chance, any outsiders learn of it, they will say I Was Never Here. The Trope Namer is the US National Security Agency, which from 1952 to 1957 officially didn't exist. Even after that they were very reticent about what they did* for the record, their job is primarily cryptology and analysis of electronic intelligence, leading many in the government to snark that the abbreviation NSA really stood for "No Such Agency." Subtrope of Government Agency of Fiction and Covert Group and often a supertrope to The Men in Black. Compare Government Conspiracy. May overlap with Benevolent Conspiracy and Milkman Conspiracy. Likely to reside in a Black Site. Hypnos of Digimon Tamers. Originally, it was kept secret because its signals intelligence activities could be seen as privacy violations. "Section 9" in Ghost in the Shell: Stand Alone Complex is not supposed to exist following the events at the end of the first season. Of course, there's a second season and The Movie. Background Unit in Heavy Object is only a nickname as the unit itself does not officially exist nor are any of the members recorded as part of the military. They're sent on the dirty, dangerous missions that Legitimacy Kingdom doesn't want traced back to them and are completely expendable. The only reason Quenser and Heivia dodge a court-martial after Unicorn lets them take the fall for an explosion in a city is that they were never officially there. The CP9 of One Piece. While the CP1-8 (CP meaning Cipher Pol, or numbered police) are well-known government intelligence agencies, the ninth one is a complete secret that the ordinary citizens only think of as a rumor. This is because the CP9 has the right to kill whoever they feel is an obstruction to their mission. Double Duck has The Agency-full name, Agency So Secret It Doesn't Even Have A Name. Its existence is not publicily aknowledged until the story "Reboot" has the government disband it and replace it with the less expensive Direction, that proceeds to expose the former existence of the Agency in the name of trasparency, never mind they exposed all the Agency's operators to revenge from the criminals they had opposed. Paperinik New Adventures has a spy being about to say the name of an intelligence agency-only for his father, a military intelligence sergeant, to pull a gun on him as he says that even mentioning the name requires a rather high security clearance he doesn't have anymore, no matter that they had just seen an ID badge of said agency. As Paperinik New Adventures and Double Duck are specifically part of the same continuity, it could have been The Agency. Parodied in Angus Og where the Laird mentions he has a friend who "does something very hush-hush for the (British) government", only for his wife to say, in a surprised voice, that she thought he worked for MI-6. The Bourne Series: Jason and the agents in Treadstone, and later Blackbriar, are implied to be this. Conklin: I don't send you to kill. I send you to be invisible. I send you because you don't exist. "If the intelligence community is a family, think of us as the uncle no-one talks about." Trivia note: The director of that movie also directed episodes of a certain tv series. When the investigator protagonists in Vladimir Serebryakov and Andrey Ulanov's From America with Love reach the NSA, they are in effect never get past the doorman. After they were politely shown the door by a self-professed Major in a plain civilian suit, one of them remarks that it's only to be expected  the NSA headquarters was the only building he'd seen since the arrival to the USA which had the false windows. In Hellboy, one of Tom Manning's jobs is to deny the existence of the Bureau of Paranormal Research & Defense and cover up all evidence of their missions (which is a deviation from the original comic books, where the Bureau's existence was public knowledge). But in the sequel, Hellboy deliberately reveals the Bureau's existence by appearing on a live news broadcast. In Kingsman: The Secret Service, the Kingsmen are an international independent espionage agency that makes sure everything is okay in the world. But no-one knows of its existence. Same goes for their American counterpart the Statesmen in the sequel The Golden Circle. Played With in the Men in Black films and animated series: they started as a government agency in the late 1950s, but by The '90s are independent and get their funding from royalties on alien technology, so they mind-wipe even the government officials to deny their existence. James Edwards: Hey, what branch of the government do we report to? Agent Kay: None, they ask too many questions. Mission: Impossible  Rogue Nation has both the Impossible Mission Force itself and the Syndicate, which turns out to be an agency originally created by the British Secret Intelligence Service (a.k.a. MI-6) that has since gone rogue. However, IMF itself does have official status in this movie to some degree: while still a super-black agency, it does have oversight and is accountable to the Senate Intelligence Committee (to an extent: Ethan's boss Brandt is shown refusing to talk about any IMF operations without permission from the Secretary, whose position is vacant at the moment). The covert organization in all iterations of Nikita, including the two TV series and the Transatlantic Equivalent Point of No Return, is a black-ops program for assassination and counterintelligence that does not officially exist. Which has allowed the program's leader to turn it into a work-for-hire operation that the government can't shut down. In Nixon, the President feels that he can't rely on the FBI or the CIA, so he institutes his own personal covert agency, The White House Plumbers. Red: The CIA Back Room. Lampshaded in its debut scene. The Academy in Serenity. A variant is the Operative. Scientist: I see no listing of name, or rank. Operative: I have neither. Like this facility... I don't exist. Deconstructed in Transformers when Lennox, Epps, and the other Special Forces troopers refuse to take orders from the Sector 7 agents because their unit does not officially exist. "That's right, and we don't take orders from people who don't exist." The assassination agency CURE in The Destroyer novels, which was created by President John F. Kennedy to protect the U.S. by working outside the Constitution. The Dark Clerks in Ankh-Morpork are a myth, as everyone knows. If they weren't a myth, they'd be employed by the Patrician to deal with problems when the City Watch can't find any evidence of lawbreaking and the Assassins' Guild would leave too much of a paper trail. And the History monks? No Such Monastery! Much like the Men in Black example, Played With by the Ministry of Magic in Harry Potter. Its name suggests a governmental department on par with the Ministry of Defense and the Ministry of Justice, but no-one in the U.K.'s Muggle government knows it exists other than the Prime Minister, and they certainly don't report to him, unless bursting in unannounced at irregular intervals to give him information he has no context for and can't possibly act intelligently upon counts. The Honorverse book Shadow of Freedom introduces the Mobius Secret Police, an agency whose existence is a state secret, even though literally everybody on the planet is aware of their existence. In practice, it is a domestic intelligence and espionage agency that exclusively employs undercover agents. One character muses on the fact that on most other worlds, a Secret Police would not try to keep it's own existence a secret, and wonders if the agency's founder even understood what the phrase meant. The Rainbow counter-terror unit in the Tom Clancy book and video game series Rainbow Six. Officially all its operations were performed by special forces units loyal to the country they occurred in. Unfortunately, ex-KGB freelancer Dimitri Popov realizes what's going on due to a British member of the team habitually smoking a pipe after operations. By the later Ryanverse novel The Teeth of the Tiger, Rainbow has apparently become an Open Secret in the government. Teeth of the Tiger introduces "The Campus", a play on this trope. Another counter-terror organization set up at the behest of President Ryan, it operates completely outside of government oversight, relying on its cover as an investment firm for funding. Aside from Ryan, only a handful of people within the government are even vaguely aware there is more to The Campus than meets the eye, and the vast majority of those are mid-level types acting as "talent scouts" for the organization. In the Matt Helm series of novels written by Donald Hamilton, the U.S. assassination agency with no name that Matt works for. In Robert A. Heinlein's The Puppet Masters, the narrator explains up front that you've never heard of his organization because they do not exist. Quiller works for The Bureau, an organization directly responsible to the Prime Minister of Britain, with "powers that would be called into question in the House of Commons should its existence be revealed". In The Wizardry Consulted, when Wiz under a geas bounces his online chats with his friends off of a website that, unknown to him, was one of many fronts for a No Such Agency. Since No Such Agency didn't have a team able to hunt down Wiz (him being an actual wizard on an alternate world where magic works, and No Such Agency not specializing in computer crime anyways), they had to ask the FBI to try and track down where the hacking were coming from. You don't really want to know what would happen if they could have tracked him down themselves. Bureau 13, an agency so secret that even its name is rarely known. The one guy that told Captain Sheridan the Bureau's name ended up dead shortly afterwards. The RPG has another example in the Blue Berets, a secret telepath branch of Earthforce created to counter a possible insurrection of the Psi Corps. Their description starts with a denial of their existence or any possibility thereof. "The Agency" in the 2000 Invisible Man TV series is an interesting variation. Due to their low budget and few personnel they had to exist mainly as a deniable floating task force for other government agencies, such as the Department of Fish & Game. The IMF (Impossible Mission Force) in Mission: Impossible. Famous for the warning given to its leader before each mission. "If you or any member of your IM Force are caught or killed, the Secretary will disavow all knowledge of your actions." Special Unit 2 does not officially exist, which leads to the female lead taking some flak when she claims to have met a member. They exist to deal with everything else that doesn't officially exist. Fifteen years into the project, Stargate Command remains a secret known only to cleared members of the participating militaries and the highest government officials of the 50 nations that are signatories to the Antarctic Treaty System. The latter were only read into it because there's an Ancient outpost underneath the continent. The project was supposed to go public in the third Stargate SG-1 movie, Revolution (partly because the number of people involved is in the thousands at this point, making keeping the secret increasingly difficult), but the plans for the movie were derailed by MGM's bankruptcy. The NID is also portrayed in this manner. Indeed, it was originally supposed to be referred to as NRD, standing for No Real Department. However, this sounded too awkward and so was changed to NID. When Section 31 is revealed in the Star Trek: Deep Space Nine episode "Inquisition", Ben Sisko mentions he queried Starfleet Command on the organization. Command refused to either confirm or deny its existence. It's indicated that most of Starfleet Command and the Federation government really don't know that Section 31 exists, and it doesn't actually answer to anyone. In one of the novels, someone visits Bashir representing "the organisation you know as Section 31". When Bashir questions this, the agent explains he's never had occasion to use any name for his employers. When Section 31 shows up in Star Trek: Enterprise the name is implied to refer to Article 14, Section 31 of the (United Earth) Starfleet Charter, which allows bending rules in times of extreme threat — suggesting that Section 31 is less a name for the organisation and more a mission statement. In Threshold the eponymous agency's very existence is classified, with its operatives having to impersonate other federal agencies' agents when on the job. In Dawn of a New Age: Oldport Blues, the woman pursuing the superpowered heroes, Sarah Travers, has a badge that links her to the Department of Justice- however, she says the actual organisation that she represents doesn't officially exist in any form, just in case something goes wrong and she needs to disappear. Bureau 13 in Bureau 13: Stalking the Night Fantastic. It's an undercover branch of the U.S. government dedicated to identifying and eliminating supernatural threats. Conspiracy X. The main opponent organization for the Player Characters is a secret government agency called the National Defense Directorate AKA the Black Book. The eponymous Delta Green was originally an official non-existent government agency. When it was disbanded, its members continued to operate covertly and illegally, becoming an unauthorized No Such Agency. Their rival and enemy is MAJESTIC-12, another official No Such Agency which oversees relations with The Greys, attempt to study and weaponize their technology while complying to their demands (Which is basically control the United States), they are mostly formed by CIA, NSA and NRO agents. 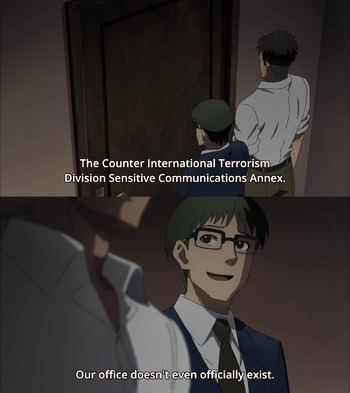 After 9/11 and the reorganization of the US intelligence community, Delta Green was revived, given a proper government standing and using The War on Terror as a cover of their operations against the mythos. A group of old guard agents were suspicious of this new organization and created their own Renegade Splinter Faction mantaining the old conspiracy structure. Some other countries also employ agencies similar to Delta Green, with GRU SV-8 in Russia, PISCES in the United Kingdom and M-EPIC in Canada. The GURPS Black Ops campaign setting is about the player characters working for "The Company". The Company is a highly secret organization that was founded by a select few individuals after World War II as a "conspiracy of protection" for the purpose of protecting humanity and Earth from all manner of paranormal threats. The number one rule given to all Black Ops agents is to protect the conspiracy at all costs. Psionics: The Next Stage in Human Evolution is about several massive conspiracies using people with psionic powers to further their own goals, so several organizations, locations, people, etc. don't officially exist. Finding out about them is likely to get you killed or on the radar of some very nasty people too. The Grey Knights Adeptus Astartes chapter in Warhammer 40,000 are a curious example, as their existence is considered an urban legend in the Imperium, and only a select few of the other Space Marine chapters (namely the Space Wolves and Blood Ravens) are allowed to learn of their existence. In addition, they are considered the militant arm of the Ordo Malleus, making them soldiers of the Inquisition. However, anyone else who fights alongside them are either killed or mind-wiped after the war is over in order to preserve their secrecy. Only the Space Wolves have managed to escape this, primarily because there were too few Grey Knights left after the first War for armageddon, and afterwords dealing with the situation would have required calling the entire chapter to heel, something that is virtually impossible to do to a first founding chapter. Note that the Grey Knights did try... and the Space Wolves defeated them. The eponymous Alpha Protocol doesn't exist for the purpose of providing deniable assets to the U.S. government. The program also hasn't had an unknown number of predecessors, all of whom haven't been burned, buried and disavowed the moment they get too close to being undeniable. In the Halo series, Section Zero is the completely-classified arm of the Office Of Naval Intelligence who handle its Internal Affairs, and have a functional license to kill anyone they have to in pursuit of their missions; they "erased" hundreds of soldiers and test subjects and burned huge numbers of files when they buried the failed Spartan-I Program. Even within ONI, they're regarded as an urban legend at most. The Corsairs in the Mass Effect universe are a branch of Alliance Marines who conduct black ops for the Alliance without official orders. Typically for the Alliance, they still have tons of red tape to navigate and have limited effectiveness. Blackwatch, the covert-ops branch of the Overwatch organization. While Overwatch functioned as public face and The Paragon, Blackwatch dwelt in the shadows. Doing the dirty work regular Overwatch couldn't be connected to. Their reveal by spiteful ex-leader Gabriel "Reaper" Reyes brought them and Overwatch as a whole down. Blackwatch, the government organization tasked with stopping the virus in [PROTOTYPE] officially doesn't exist and has no insigna. Newscasts played during the credits suggests that even by the end of the game, most people assume they're just part of the USMC. They're more of an open secret by [PROTOTYPE 2] though. Section 8: Prejudice introduces a unit called the Spear which serves as the game's Big Bad. It was an elite paramilitary unit intended to exterminate any alien life that could be an obstacle to human colonies (read: all of it), but its leadership began to get mentally unstable (partly from remorse) and they were disavowed and ordered destroyed by USIF regulars. They've come back for revenge. Soldier of Fortune has The Shop, a covert government organization that conducts black operations around the globe. The Third Echelon in the Splinter Cell series is a black ops and intelligence agency of the US government. Their existence is hidden even from the NSA, which they are technically part of. When their existence is exposed in Conviction by way of a Tyrant Takes the Helm making an Assassination Attempt on the U.S. President, they are publicly disavowed, and the President sets up an even more Covert Group that doesn't even have a stationary base of operations, Fourth Echelon, in Blacklist. "The Agency" from the Syphon Filter series was this for the first three games. Starting with 'The Omega Strain' the agency was reorganized into an Open Secret called the International Presidential Consulting Agency (IPCA). Although their existence is now known to the rest of the world their activities are supposed to be highly classified with only the President of the United States having full authority and oversight of the organization. The title organization in Tom Clancy's The Division is this up until the start of the game. A group of highly trained deep cover agents seeded throughout the U.S. by the government, whose job is to help contain major crises that are beginning to spiral out of control, and have the advantage of being locals, thus good knowledge of geography, and direct or near direct knowledge of what's going on. The pandemic and societal collapse sweeping New York City in the game convinces the government to activate and reveal them for their first operation. The title project of XCOM: Enemy Unknown is also disavowed throughout the entire game. No matter what equipment they donate to member-nations, no matter how many civilians they rescue when dealing with alien Terror Strikes, the organization itself is never revealed. The most that the general public knows is the news reports of highly trained soldiers with advanced equipment being sighted occasionally fighting the alien invaders, with all governments involved denying knowledge about them. In Exterminatus Now, the protagonists manage to get away with getting a gigantic and extremely expensive secret research facility owned by their employer sucked into a dimensional portal by the fact that since it was completely off the books and officially non-existent, there's no evidence that can be used against them. Said employer has a fit when he realizes this. Trying Human, which is about Alien Abductions and related phenomena, has Majestic 12, a group dedicated to controlling alien presence on Earth. They're so secret they don't use their personal names among themselves. More seriously, Area 51 was a real-life subversion for most of its existence, as it was at least official enough that the President of the United States had to sign off on its budget every year. Though what they get up to is anyone's guess. The theories that the typical man on the street knows about all boil down to "Aliens! ", but those more grounded in reality speculate that it's where the Air Force tests the cutting-edge technology of tomorrow, like stealth planes were in the Eighties. It's even possible that the alien conspiracy theories are actually encouraged because they obfuscate what's actually going on at the base: the aforementioned cutting-edge technology. On August 16, 2013 Area 51's existence was confirmed by the US government. It was, in fact, used to test the Lockheed U-2 spy plane, and reportedly their programs resulted in an increase of UFO sightings in the area. It's generally presumed that such testing of current aircraft and missiles has been moved to other locations by this point, since Area 51 has become too famous to keep anything that actually has to leave the ground secret. Its intensely creepy British counterpart, Porton Down, toys with this trope. On the one hand, it is known to exist, and it is known that in the 50s at least, it dabbled in human experimentation... something that was only admitted after 50 years of legal battles by the family of one young soldier who died horribly after exposure to the nerve agent Sarin. It also admitted that it once rendered an entire (admittedly small and mostly empty) island off Scotland uninhabitable for several decades in experiments related to Anthrax, and exposed coastal towns to E Coli bacteria as a supposedly relatively harmless way of figuring out how a biological attack would spread. Now, it claims that it merely studies biological weapons to defend against them, but no one really believes them - the fact that a BBC documentary team allowed in to look around had most of their questions along the lines of "what goes on in that building?" answered with a stony, "That's classified" did not help. The fact that the head of the House of Commons Defence Select Committee (equivalent to a Congressional Committee) said in 1999, "I would not say that the Defence Committee is micro-managing either DERA or Porton Down. We visit it, but, with eleven members of Parliament and five staff covering a labyrinthine department like the Ministry of Defence and the Armed Forces, it would be quite erroneous of me and misleading for me to say that we know everything thats going on in Porton Down. Its too big for us to know, and secondly, there are many things happening there that Im not even certain Ministers are fully aware of, let alone Parliamentarians," didn't help either. Much like the NSA up in the heading, the US National Reconnaissance Office was a covert organization from its founding in 1961 to the declassification of the "fact of" their existence in 1992. Security around the agency was so tight, even their letterheads were marked "Secret". not that it mattered since the press had known about them as early as 1971. The British Secret Intelligence Service, more famously known as MI-6, wasn't officially acknowledged to exist until 1994 (though thanks to their long association with the James Bond franchise, pretty much everyone knew about them anyway). In his 1976 book The Governance of Britain, outgoing Prime Minister Harold Wilson had a chapter devoted to the SIS... which was one paragraph long and can be summed up as "An organisation exists, is funded by the taxpayer, and that's all I'm saying". Even now, they can get a bit touchy about their activities being brought up - Mitt Romney, during his run for President, caused a small diplomatic incident by casually revealing that he'd met agents of MI6. While the SAS is a (some would say the) Special Forces unit and part of the British Army rather than the Intelligence Services, despite being formed in 1941, they were largely unknown until their highly conspicuous role in ending the Iran Embassy Siege. Even now, their post-war history is rather vague, and it is the policy of the Ministry of Defence and the Government not to comment on what they're doing for reasons of operational sensitivity. The unit fomerly known as the Intelligence Support Activity , they serve as the intelligence gathering division of the USSOCOM and JSOC, providing intelligence for other units such as the SEAL Team 6 and Delta Force. Officially it was "disbanded" in 1989 but it continued existing, every information available is classified and the new name is a series of codenames that frequently changes. Some of the most famous codename include: Centra SpikeNote Used during their operations in the hunt for Pablo Escobar, Grey FoxNote Used in the 2001 invasion of Afghanistan and Inteprid Spearnote Current or last codename known.